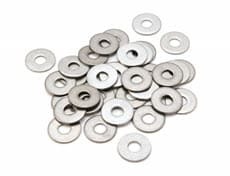 Inconel 725 flat washers are strong and corrosion resistant making them well suited for seawater applications. In fact, Inconel 725 flat washers are twice the strength of Inconel 625 thanks to its heat treatment. Made with nickel, chromium, molybdenum, and niobium, Inconel 725 is an age-hardenable alloy that has essentially the same corrosion resistance as Inconel 625. Importantly, Inconel 725 is resistant to hydrogen embrittlement and stress-corrosion cracking as well as being incredibly tough. Whatever Inconel 725 flat washer you’re looking for, if we don’t have it on our shelf, we can quickly get it to you. Our washer manufacturing capabilities range from small (under 100 pieces) to large runs. We will custom make your Inconel 725 flat washers to your exact specifications. Contact us today by calling 1-800-736-5014 or filling out our contact form.